Ben Foster’s lapse in concentration cost Watford dear as Arsenal claimed a 1-0 victory over the 10-man Hornets on Monday evening. See how the match unfolded, see photos of the action and get all the big-match stats and reaction via our Live Centre. The Gunners netted what was to prove the winner after just 10 minutes when Foster dallied too long on the ball and what should have been a routine clearance ended up in the back of the net as Pierre-Emerick Aubameyang charged down his kick and diverted the ball into an unguarded net. Watford’s cause was further hampered just 90 seconds later when Watford talisman Troy Deeney was shown a straight red card for a callous elbow in the face of Lucas Torreira. Cojones? Some might say…. Foster – so reliable in the Watford goal this season – inexplicably dallied when clearing his lines and could only smash the ball into the foot of Aubameyang as he tore down on him, the ball flashing into the empty net. If that was not enough, captain Deeney was dismissed moments later as he appeared to catch Torreira with a stray forearm. 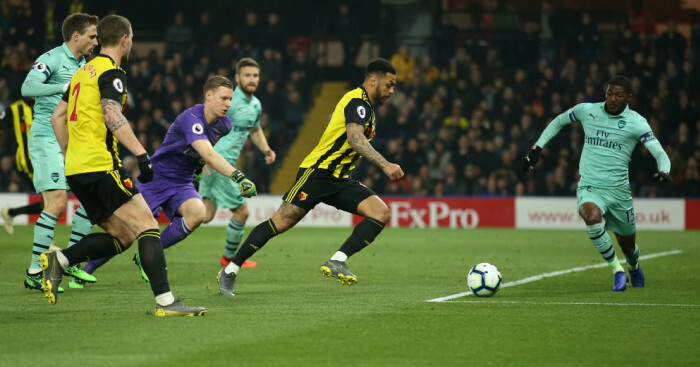 The post Arsenal up to fourth as rare Foster blunder gifts win at Watford appeared first on teamtalk.com.